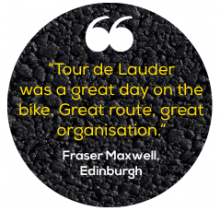 The world famous Tour de Lauder is without doubt one of the monuments of the cycling calendar, a one day classic right up there with Milan San Remo and Paris Roubaix! Thank you to everyone who took part in, volunteered at and supported the TdL in 2018 - you have helped raise over £41,000 for all the charities involved, including £4000 for Fresh Start and £5,000 for the TdL Community Fund! Don't forget to register your interest for 2019 on the Register page to ensure you are the first to know about the release of the 2019 places on 1st January 2019. Please click the above image to view our video of TdL 2015. View our Facebook page when you will find images from previous Tours. Tour de Lauder raises funds for the Steve Cully Tribute Fund, which was set up by Chest Heart & Stroke Scotland on his wife Rosie’s wishes, in memory of Steve, a Lauder resident and keen cyclist. All donations much appreciated - you can donate to the fund here.